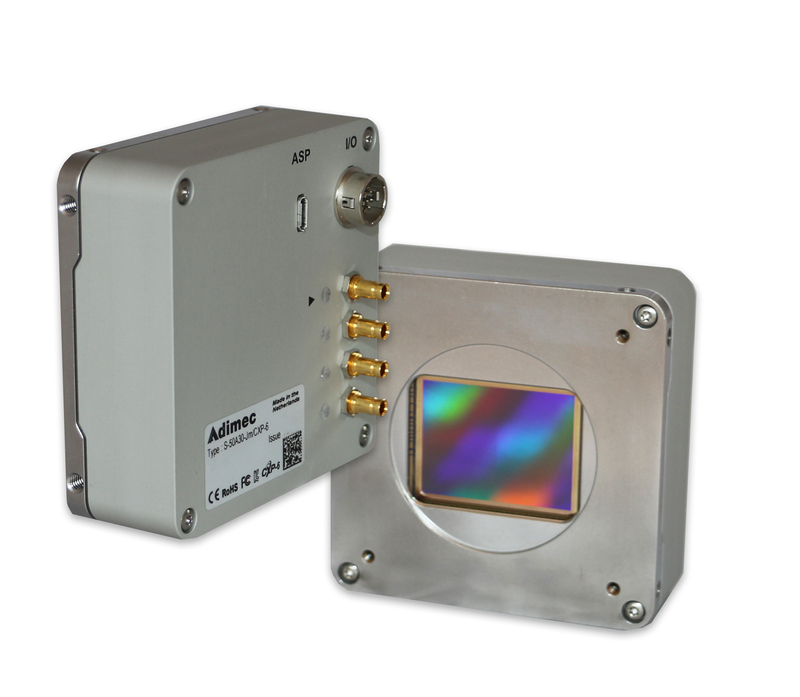 Adimec is introducing a new 50-megapixel camera the S-50A30 based on the CMOSIS CMV50000. The new camera provides more than just higher resolution. This CMOS camera, provides inspection accuracy increases, the highest inspection throughput at 50 Mpx, and the next step in image quality. This is a three-part series that illustrates why to choose a 50 Mpx camera. We will compare to 25 Mpx cameras and high-resolution CCD cameras. In part one we discussed the inspection accuracy increases including a 20% square resolution increase along with a doubling in total resolution compared to a square 25 Mpx sensor (e.g. S-25A70/80), stellar image uniformity, and a sharp image over the entire Field of View (FOV). In part two we discussed inspection throughput improvements at 50 Mpx including >4x higher inspection throughput compared to CCD image sensors; increased throughput with less movement steps via increased field of view; and how Adimec Connect & GrabTM ensures a fast and easy system integration with the stable high-speed CoaXPress interface. Finally, in part three we discuss the CMV50000 as the next step in image quality, exemplified by improved sensitivity, being ideal for darkfield, brightfield and phase shift metrology applications as well as an example showing its readiness for display inspection applications. The S-50A30 is the right solution for display inspection because of several characteristics. The 4:3 aspect ratio matches or covers those of mobile phones and television displays. Low contrast levels can be inspected with high sensitivity and low dark current. It uses a global shutter which allows for inspection of all displays without concern for display refresh rates. 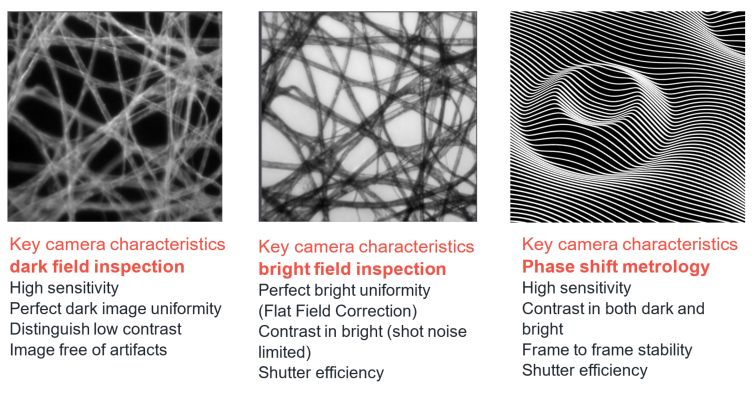 High inspection throughput rates can be achieved with better sensitivity and higher frame rates than competing CCD cameras. The AMS CMOSIS CMV50000 is the next step in CMOS image quality. The S-50A30 is ideal for both 2D Bright and Dark Field imaging as well as 3D metrology. With its superior image quality, the S-50A30 can be perfectly used for 2D with dark-, bright field inspection and 3D phase shift metrology. With Adimec’s repeatable performance each camera has optimized calibrations, which can be optimized for the application via in-system calibration. The graphics below show Bright and Dark field measurement setup and the right graphic the fringes typical of one 3D technique. The S-50A30 offers higher sensitivity. Higher quantum efficiency across the visible spectrum means improved sensitivity for the sensor. 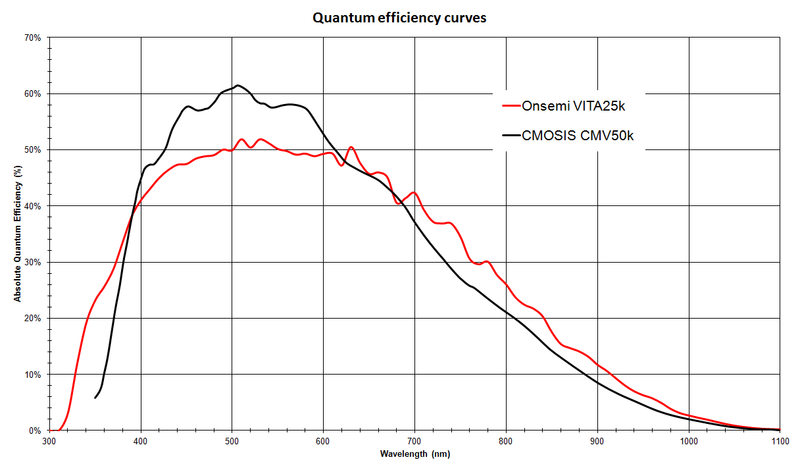 The Quantum Efficiency is increased by 20% with respect to the 25 Mpx ON semi VITA sensor. 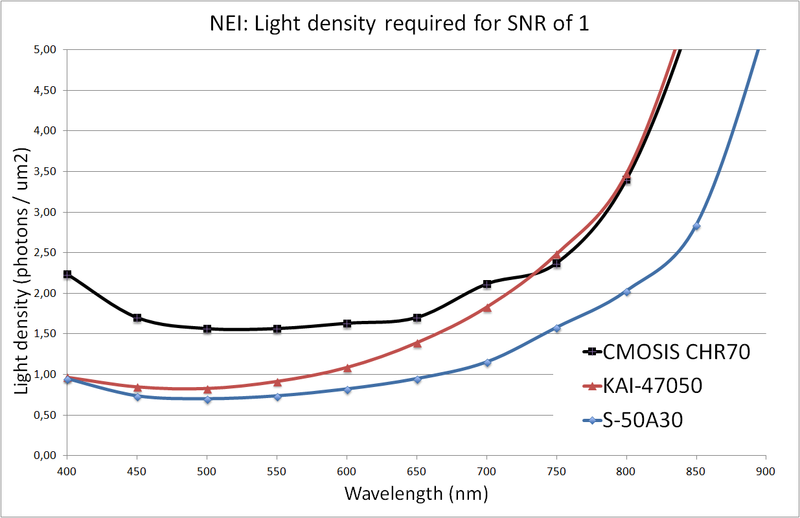 And more impressive is the improvement in absolute sensitivity of the S-50A30 as measured by the Noise Equivalent Illumination (NEI) where lower is better. This model includes pixel size, noise floor and Quantum Efficiency. An example of the S-50A30’s use would be display inspection applications. With the trend of resolution increase in displays, change to OLED and curved and flexible displays it’s challenging to perform quality inspection of displays. The S-50A30 covers the high-resolution aspect ratios of displays and fulfills the important key requirements on image quality at an acceptable cost level. This combination creates the ideal solution for display inspection tools and supports human inspectors by giving them a much better view of the device under test. With winning throughput and superior image quality combined with high-resolution and increased field of view the S-50A30 is ideal for display inspection applications. This series has introduced the CMOSIS CMV50000 and the S-50A30 camera and shown that it represents more than a step-up in resolution, speed and throughput over the high-resolution CCD sensors. This third blog focused on suitability for 2D & 3D metrology, Bright and Dark Field metrology and improved sensitivity of the camera. Finally, we discussed the suitability of the S-50A30 for display inspection applications. If we have piqued your interest, please click here for a product data sheet.